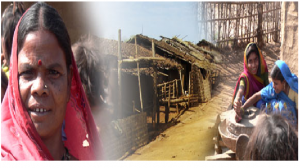 Inhabitants of Melghat are predominantly scheduled tribes. These include ‘Korku’, ‘Gond’ and ‘Nihal’. ‘Balai’ is a major constituent in the category of scheduled castes. A race designated as ‘Gaolan’ belongs to backward class. The remaining population is made up of ‘Gaoli’ and others. It is seen that majority of the villagers residing within the MTR are Korkus and percentage of Gonds, Balais, Gaolis is limited. Traditionally Korkus had been drawing their sustenance mainly by engaging themselves in forest produce harvesting works for a period of almost one century. They have provided labour force for all the forest conservation and development works. They have acquired skills required for harvesting forest products and used to be employed earlier for processing of forest produce to market. For them, agriculture used to be a supplementary activity. Only after 1973, the villagers acquired permanent rights on the land in their villages and have been since pursuing agriculture practices. Their land holdings are limited and majority of them hold hardly 5 acres or so per family. They do not have inclinations for dairy development. Korku’s and Gond’s needs for the forest produce for bonafide use have been recognised and thus concession to collect the same from the forest areas are being honoured. Korkus do indulge occasionally in trapping of jungle fowls, peacocks and they occasionally indulge in even killing of herbivore like Chitals and Sambars through dogs, traps and poisoning of waterholes. Fishing, legal or illegal in one of their main passions. As compared to Korkus, Gonds are less compatible with forest eco-system as they do indulge on a higher scale in poaching. They may even resort to killing of Gaurs. Nihals are akin to Korkus, but are known to eat meat of dead animals also found inside the forests. They are placed at a lower rung in the social hierarchy. Balai, who are settled in the villages, located in the Sanctuary have been following agricultural practices, though traditionally they used to scavenge in the villages. The group Gaolan is considered socially higher as compared to these scheduled castes and has been traditionally following agriculture. For construction of meter gauge line, connecting Khandwa and Akola, labour force of a community was obtained from outside. After completion of the railway line, many of these, have now settled down in certain areas. These people are locally known as ‘Rathyas’. They are hard working and aggressive nomads from central provinces. They have dominated the local inhabitants in some areas completely.